The Money Game is a series of stories on the games people play with money and markets. 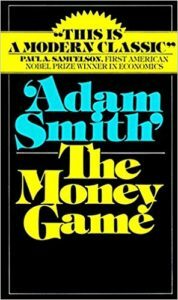 Told by Adam Smith (aka George Goodman), the stories uncover the emotion, error, myth, and irrationality that surrounds it all. The game can be defined several ways: 1) something done as sport or fun; a diversion of sorts to keep things interesting, or 2) something more along the lines game theory, through math and weighing probabilities to decide on the most likely outcome. Ask a dozen people the value of a stock and you’ll get a dozen answers. It’s best to view stock valuation as a range, instead of a fixed price. The factors that give a stock a value and price come partially from the financial statement, and mostly from the mood of the market. The mood is what makes a system, a theory, a strategy, or a rational view on markets imperfect, imprecise, sometimes wrong, and irrational. Mood makes markets biological, complex, and in a constant state of change. You have to know yourself. You have to be observant and honest and learn from mistakes. The decisions made around investing paint a portrait of who we are — biases and all. It’s better to figure it out, learn from it, and use it to our advantage, then to ignore it, fight against it, and fail. Emotional maturity, remaining calm, keeping your cool, discipline, and patience are all used to describe a way of being in highly emotional, stressful, or anxiety filled situations. In other words, the markets. Succumbing to the stress and anxiety is why investing is so costly. Everyone believes themselves to be a contrarian when really their part of the crowd. Also, human nature suggests most people find comfort being part of the crowd. Every bubble or euphoric period — from tulips to South Seas shares to Nifty Fifty to Dotcom stocks — must start with a rational idea. As the story spreads, the crowd mentality takes over, till it eventually peaks. Then every dip lower becomes a false buying opportunity. Why do they play the game? For many different reasons: the action, the image it presents, the sense of belonging (being in a crowd), being on the “inside”, the stories to brag to friends and strangers, basically, so they can say they play the game. And few people actually play for the money. All the participants play the game differently. They make up their own set of rules and have a different definition of winning. And they often change the rules and the definition multiple times depending on how well they’re playing. Greed and fear are the strongest emotions in the market. Nobody likes to watch others make more than them. And we hate losing more than like winning. Those two emotions (along with others) have a huge impact on an investors willingness to change goals and time horizons. Hesitant, cautious, and timid at the bottom. Bold, confident, and audacious at the top. The exact opposite of what’s necessary for success. Any sense of attachment or emotion to an investment can lead to a humbling experience for the most brilliant investors. “The most important thing to realize is simplistic: The stock doesn’t know you own it .” Nor does it care. Investing is the epitome of a one-sided relationship. Emotional connections don’t exist. Detachment means you can change your mind or reverse course, without being tied down by prior decisions. Beware of goals identified by numbers because it’s easy to fixate on a big round number and sometimes the goals — goalposts — often get moved by jealousy or envy or greed…or dreams. How many investors, despite big gains, hold on for “just a little more” and never got there. In the book, that’s the story of Harry, who could be anybody. He fixated on $1,000,000 because that was a life-changing number. He came close so many times, and took big risks (margin) to get there, but failed because anything less wasn’t enough. The trouble with high growth companies: they carry the seeds of their destruction. Unless the company has some advantage, the high growth attracts copycats. Growth is spread across competitors, prices get cut as they battle for market share, and profit margins suffer. And when that doesn’t work, there’s a point where growth falters because growth is finite. Companies grow too big to grow at a high rate and there’s no magic number that says when they hit too big. And then there’s the market. There’s no way to know the multiple the market would put on the growth. Irregular Rule #3: “Find smart people.” Phil Fisher, the creator of the scuttlebutt approach, looked at his past successes to find that only one-sixth of them were found through scuttlebutt. The five-sixth, the rest, were from a network of smart people he knew and trusted. The downside: groupthink. Many people choose to play the game as described by Keynes’s beauty contest: “We have reached the third degree where we devote our intelligences to anticipating what average opinion expects the average opinion to be.” So all kinds of systems have sprung up to figure out what is everybody else doing? Really, they’re finding out, what has everybody else done but never solving, what will everybody else do. But why what is everybody else doing? Because it’s comfortable. If you’re doing what you believe everyone else is doing, you’re making money when they make money, losing when they’re losing, and risking about the same as everyone else. Doing the opposite of everybody else is often an uncomfortable place to be. If those systems, actually worked — could always predict what everybody else was doing — everyone would use it, and it would stop working. An overreliance on mathematics imbues an expectation of precision in markets that are rarely precise. The more complex the math, the more speculative the results. Accounting standards and financial statements imply precision too, yet earnings can be manipulated up or down any number of ways. Example: there is no uniformity between companies on depreciation charges, amortization, inventory valuation, or goodwill. The implication: using complex math and “manipulated” financial statements to unearth things like precise earnings or growth trends is impossible. Investing is more art than science, so treat it as such. The truth is almost every investor, broker, analyst takes the accounting numbers at face value and rarely spends/has the time to look past the image management wants to project to see what’s being manipulated, why, and what it really means. The quote above refers to the conglomerate craze of the ’60s — see ITT and TLV — that used acquisitions to show earnings growth and accounting trickery to hide the real losses. There has always been a They in markets, which Smith refers to as elephants, that move markets at a whim. On the Depression: “It is a sobering experience to read through—as once I did—all the Wall Street Journals and Barron’s from 1929 to 1933. Quarterly, reports came out saying, ‘the outlook is favorable,’ ‘a sustained recovery is on its way,’ and so on. But nobody was listening. Those on margin had been sold out in 1929 and 1930. But from 1930 to 1933, a real blight of the spirit took place.” From 1929 to 1933, the Dow fell almost 90%. The Depression described the economy and the mood at the time. Much like what Smith describes, the book Oh Yeah!, published in 1932, relays a lot of the forced optimism from CEOs and the government who repeated said a recovering was right around the corner. Liquidity, or lack thereof, is the biggest threat to short-term performance chasers. If everyone wants to get out, and no one is buying, losses pile up fast. The risk to funds managers includes optics: how does it look to own big losers, how does it look to own winners, how does it look sitting on a big pile of cash while the market rises. It’s career risk. Not many are willing to bet their jobs by looking wrong or dumb in the short term, even if looking wrong produces great results in the long term. The end-of-the-worlders, doomsayers, and gold-bugs have existed in markets forever and their calls will never cease. Money is how the game is scored…a path to being rich. The conundrum lies in how you define rich. You can treat it as a possession to see who can collect the most or you treat it as a means to an end, the means being financial freedom and enjoyment of life. Or read other book notes.